Chuck Hagel: How Would a Filibuster Play Out? The Hagel Vote: Counting to 51 or Counting to 60? 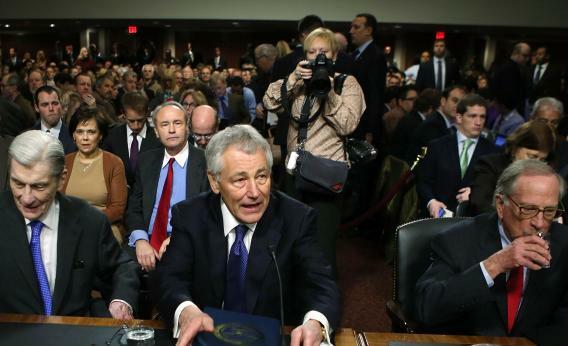 Former U.S. Sen. Chuck Hagel (R-NE) takes his seat as he arrives at his confirmation hearing to become the next Secretary of Defense before the Senate Armed Services Committee on Capitol Hill January 31, 2013 in Washington, DC. The first, best hope of the anti-Hagelians was a bipartisan split. They wanted a Democrat worried about re-election, or worried about alienating donors, to be so worried about Chuck Hagel that he came out against the nomination. The story would have become “Nominee Under Fire From Both Parties.” Alas, after a few teases—mostly Ben Cardin and Chuck Schumer declining to immediately endorse the nominee—they failed to get converts. But Tower was a Republican nominee rejected, with 53 “no” votes, by a Democratic Senate. Since 1975, when the margin for a filibuster was set at 60 votes, no Cabinet nominee has ever been subjected to it. He didn’t brim with confidence, but that’s not really the Levin style. And you don’t pound your chest if your only impediment is an unprecedented filibuster.